Weapons of Peace by Peter D. Johnston - Reading Room - Craxme.com - Powered by Discuz! What If the Nazis Developed the AtomBomb First? In this novel inspired by two true stories from the Second World War, a youngBritish nurse and a seasoned American negotiator, both plagued by remorse, tryto change the course of history—and their own lives. Recovering from gunshotwounds and confined to an ancient English castle, America’s top negotiatorshares the secrets of his interrupted mission and his craft with the onlyperson he dares to trust—a young British nurse with a troubled past. When sheproves to be an exceptional student of his laws of influence, he urges her tohelp him complete his mission: Hitler has an atom bomb, and his scientists mustbe persuaded to undermine their own creation. 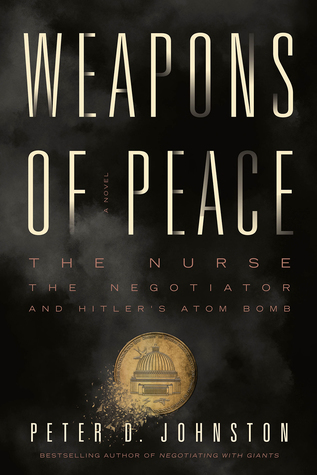 Weapons of Peace races from an ancient English castle and abizarre killing in Washington, D.C., to a scorched atomic test site in Germanyand hidden passages forged under Berlin by resisters plotting to murder Hitler. Johnston’s expert hand blends real-world historical material withheart-pounding action, unforgettable characters, and precious insights intoinfluence and how the Nazis negotiated their way to power and kept it — athought-provoking thriller that immerses us in one of history’s most pivotalmoments. PETER D. JOHNSTON is an internationally renowned negotiation expert and the bestselling author of Negotiating with Giants (nonfiction). His expertise—which has been formally recognized by the US Government for its positive impact—is sought worldwide by individuals and organizations. A former journalist and investment banker, he is a graduate of the Harvard Business School, and has been interviewed by CNN, ABC, FOX, The Wall Street Journal, The Globe and Mail and Oprah & Friends. Weapons of Peace is his first novel.